One of the most under-utilized and most important function is the planning functionalities. Within Dynamics NAV (Navision), there are multiple ways of setting up the items and the stockkeeping units to have Dynamics NAV calculate and combine the items that you need to make or buy. The setup is in itself is a challenge to most companies since most of the planning methods that comes with NAV out-of-the-box are not correctly used by companies in a manufacturing environment. Another challenge is how to run the planning (MRP/MPS) and how to incorporate the planning process to improve upon their daily operations. In this article, we will simplify the Dynamics NAV (Navision) manufacturing process so you can at least apply some parts, or most parts of this into your company. I do understand most larger and more established manufacturers already have a planning process in place, but for some manufacturers, planning is still done manually in Excel and takes it a long time. Longer than necessary. Note that even though we’re talking about a manufacturing environment, you can still use the concepts in this article to manage your purchasing process even if you do not manufacture anything. There are basically 3 important processes in Dynamics NAV manufacturing. Let’s assume you classify your inventory items into 3 categories. – Your production orders for finished goods (FG) are created on a weekly cycle. That means you plan out what you need to produce and allocate resources and materials based on the sales orders that are due to ship this week. – Your sub-assembly (SUB) items are created on a “as needed” basis. – Your raw-materials (RM) needs to be ordered 2 months in advance. So this means for your raw materials have about 60 days lead time. In order to properly make purchase orders for the raw materials you’re going to need, you will need a sales forecast. At this point, all of you are probably thinking “our sales forecast is inaccurate/invalid/stupid/wild guess/crazy/a joke”. Before you start off on a rant about how your sales department is disconnected from the rest your organization, just remember that this is an opportunity to get them involved in this process. We need this sales forecast to be able to make a purchasing plan. The process of getting the sales or production forecast is more of an art than a science. There’s no way to accurately calculate your forecast, there are add-ons, modules, formulas out there that can help you, but in the end it’s just an estimate. And this estimate absolutely has to come from your sales team, not the production team. Your salespeople have a better understand of what they’re going to sell than the production team. Did I mention sales forecast is an art and not a science? When you get a sales forecast, it will probably only be your FG (finished goods) items. Salespeople typically sell finished goods, not raw materials or sub assemblies. In addition, your sales forecast should based on a weekly schedule. In another words, it should match to your production planning schedule as closely as possible. So if you get your forecast back from the sales department, you should split it per week. 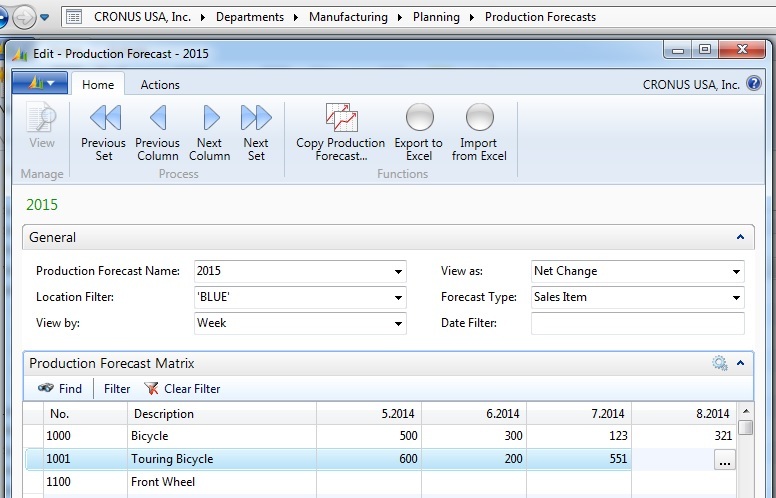 Once you have this, you will need to put this information into the Production Forecast in Dynamics NAV (Navision). After we get the forecast in, we will now run our plan 60 days out into the future. The reason we do this is because we want to make sure we create demand in the form of PPO so the purchase orders can be created. 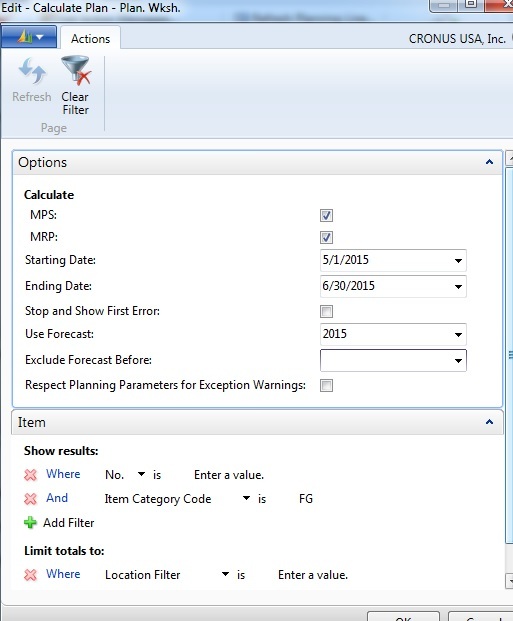 When you run these 2 processes, be sure to include forecast in your calculation. Generating the MPS and creating it as a planned production order will help us determine what we need to purchase so we can have enough raw materials to cover what our actual demand will be. Don’t worry about over buying, because when we calculate our plan, existing inventory on hand will be used as a part of our calculation. In my the part 2 of this blog post, I will explore calculating the purchasing plan and calculating the weekly production plan based on your actual demand.